Rapid Drug Detox can help detox you from Morphine. Morphine is also known by several different brand names (see below). Morphine / MS Contin / Morphine Sulfate are highly-potent opiate analgesic drug and the principal active agent in opium and the prototypical opioid. Morphine acts directly on the central nervous system to relieve pain. Studies done on the efficacy of various opioids have indicated that in the management of severe pain, no other narcotic analgesic is more effective or superior to morphine. It is marketed under several different names including: Oramorph, Oramorph SR, and Avinza. Morphine is highly addictive when compared to other substances; physical and psychological dependences develop very rapidly. Morphine is the prototype narcotic drug and is the gold standard against which all other opioids are tested. In clinical settings, morphine exerts its principal pharmacological effect on the central nervous system and gastrointestinal tract. Its primary actions of therapeutic value are analgesia and sedation. Morphine is a rapid-acting narcotic and known to bind very strongly to the receptors, for this reason it often has a higher incidence of euphoria/dysphoria, respiratory depression, sedation, pruritus, tolerance, and physical and psychological dependence when compared to other opioids. Morphine was the most commonly abused narcotic analgesic in the world up until heroin was synthesized and became readily available. Even today, morphine is the most sought after prescription narcotic by heroin addicts when heroin is scarce. Morphine and heroin are also much more likely to produce feelings of euphoria and other such subjective effects when compared to most other opioid analgesics. Call us at 1-888-825-1020 or contact us to learn more about how we can help you overcome Morphine addiction. The withdrawal symptoms associated with morphine addiction are usually experienced shortly before the time of the next scheduled dose, sometimes within as early as a few hours (usually between 6-12 hours) after the last administration. Early symptoms include: watery eyes, insomnia, diarrhea, runny nose, yawning, dysphoria, sweating, and in some cases a strong drug craving. Restlessness, irritability, loss of appetite, body aches, severe abdominal pain, nausea and vomiting, tremors, and even stronger and more intense drug cravings appear as the syndrome progresses. Severe depression and vomiting are very common. The heart rate and blood pressure are elevated and can lead to a heart attack, blot clot or stroke. Chills or cold flashes with goose bumps (“cold turkey”) alternating with flushing (hot flashes), kicking movements of the legs (“kicking the habit” – similar to restless leg syndrome) and excessive sweating are also characteristic symptoms. Severe pain in the bones and muscles of the back and extremities occur as do muscle spasms. At any point during this process, a suitable narcotic can be administered that dramatically reverses the withdrawal symptoms. Major withdrawal symptoms peak between 48 to 96 hours after the last dose and subside after approximately 10 to 12 days. Sudden withdrawal by heavily dependent users who are in poor health may be fatal. The RDD Method™ for Morphine detoxification under anesthesia is a medical procedure that eliminates most of the withdrawal symptoms. During the procedure the patient is given medication to relax and then put under light, general anesthesia for approximately 60 minutes. Following the procedure, recovery begins under direct medical supervision. The patient’s vital signs and overall physical and mental reactions to these medications are closely monitored during the detox procedure. In the days that follow, the patient often sleeps more than usual. 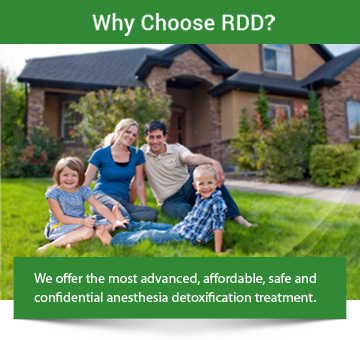 Administered by medical professionals as part of a long-term drug-addiction recovery strategy, The RDD Method™ is significantly more effective than other courses of Morphine addiction treatment. How do I know if I am addicted to Morphine? A.Short-term users may require a detox program in order to successfully discontinue use because of Morphine’s very addictive traits. Addicts typically require higher doses of the drug and experience cravings for Morphine between doses. How long does Morphine detox take? A.The detox process for Morphine varies in length depending on the pattern of typical use and on individual differences. The most severe withdrawal symptoms occur during the first several days after discontinuing use of the drug making it important to seek immediate professional help from trained Morphine-detox professionals. A.While recovery from Morphine addiction can be painful; the right procedure greatly reduces discomfort. Anesthesia Morphine detox is a procedure that is effective at reducing the pain normally associated with Morphine detox. How do I choose a Morphine-detox program?